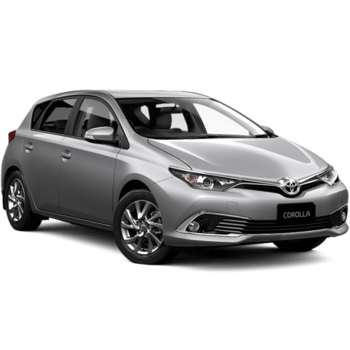 Corolla Ascent Sport Hatch - Now in Runout! * Drive away price shown includes on road costs. For Brand New cars this includes 12 months registration, 12 months compulsory third party insurance (CTP), a maximum dealer delivery charge, stamp duty and metallic paint (where applicable). Vehicle weight is calculated using the TARE weight. For Demonstrator cars the recommended drive away price shown includes the balance of 12 months registration, 12 months compulsory third party insurance (CTP), a maximum dealer delivery charge and stamp duty. The drive away price shown is based on the dealership location's postcode, and on the owner being a 'rating one' driver aged 40 with a good driving record. Please note that your actual drive away price may differ depending on your individual circumstances (including, in NSW and QLD, your choice of insurer). Accordingly, please talk to your local Toyota Dealer to confirm the price that is specific to you. Statutory charges are current as of today. Jump to it! Because right now Torque Toyota is holding a demo clearance with great deals across the range! Search the latest Dealer & Factory Special Offers available at Torque Toyota today. We have something for everyone and great savings across the Toyota range but get in quick, these deals are for a limited time, while stocks last. Call our friendly team now to book a Test Drive, Get a Quote, Make an Enquiry or simply just to find out more information about a particular special offer.